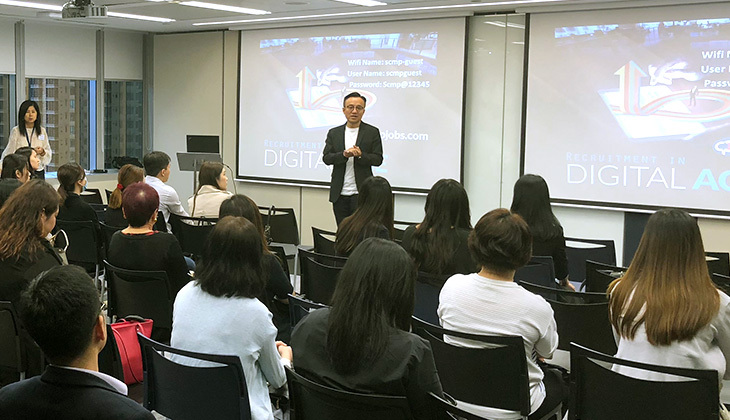 Over 100 employers and recruiters joined us in our HR engagement workshop held on 6 and 22 June to learn more about how to leverage the advertising concept to boost hiring performance and how technology helps to find the right candidates. One of the key topics in the June workshop was how to maximise return on investment (ROI) and what the recruiting metrics for measuring in the digital recruitment age are. “Traditional model charges you pay per job posting and you are left with hoping the candidate will search and find it then apply for it. Post and Pray can mean your job ads getting bumped down by newer postings every minute,” said Cecilia Kwok, business director, recruitment rusiness of the South China Morning Post. Attendees were treated to a tour of the Post’s new offices after an introduction to innovative office design by Alex Ho, general manager, recruitment, circulation and syndication business at the Post.